I have been thinking about why my friend with weak ankles keeps spraining her ankles. I have come to a conclusion I am certain that -she wears the wrong kind of shoes. I always see her in either flat sandals which provide no support or in doll shoes which also do little for her feet. I’d love to help her understand the best running shoes for ankle support so I decided to do some shopping around. 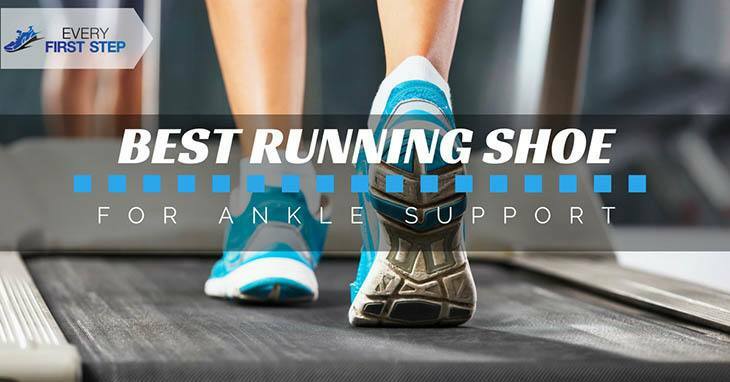 Here are the top 5 shoes I believe are great for providing ankle support and will help heal a sprained ankle fast. The first thing I noticed about the New Balance Fresh Foam is that the foam layer is thick and feels very stable. A stable, dense foam is a great feature for those who want extra ankle support. The tongue of the shoe has a soft fabric on each side and hugs the midfoot providing a comfortable, secure fit. Another good thing I noticed was the outsole which has a thick layer of rubber with flex grooves. These grooves are carved into the outsole in specific areas enabling the shoe to flex. The upper of the shoe uses an engineered mesh, bootie construction which gives it a sock-like fit. The stability, durability, flexibility, adequate cushioning and good heel support make the shoe the top of my list. The shoe also comes in both male and female versions. On the other hand, the upper of the shoe has a seam that attaches the tongue to the base which can initially cause rubbing and blistering on the side of the foot. Also, if you want a shoe that has very soft cushioning then the New Balance Fresh Foam 1080v7 may not be a good idea. If having extra soft cushioning is very important to you, you ought to try the HOKA ONE ONE Bondi 5 shoes. They have a very noticeable thick sole which provides great support and compression. The shoe is actually designed to be worn on artificial surfaces such as roads and floors thus a lot of effort has been put into making it comfortable. Another interesting feature is the 3D print structure which makes it lightweight even though it looks very bulky. The shoes also come in widths such as 2D and 4E which is very hard to find so if you have extra wide feet, they are a good option. Something I have reservations about is the bulkiness of the shoe. If appearance is important to you (it is to me) and especially if you have narrow feet, you might look like a clown. The first two picks are quite pricey and my friend is a newlywed with loads of bills to pay so I looked for something a little less costly. If you too are on a tight budget, the Reebok Ultra V DMX Max is a good option for you. They cost less than 100 USD and bring a lot to the table considering the price. One of the first noticeable features is the low cut design which is one great way to increase ankle mobility greatly. The shoe also comes in formal colors such as white and brown making them ideal for use at work. The cushioning provided is described by many as ‘walking on clouds'. This is because of the DMX Max air transfer technology which provides a cushion that moves with your step. The shoe also has a transition bridge for the smooth heel to toe feel. Some issues consumers have complained that the shoes run large and are quite difficult to find. If you are not a fan of big, heavy looking shoes, then you may want to get a different shoe. If you are willing to spend a little more money on quality shoes, the Brooks Addiction 13 is a good choice. The shoe uses the BioMoGo midsole technology to provide extra cushioning. Another interesting feature unique to this technology is that it is environmentally-friendly breaking down 50 times faster than other materials. The shoe also makes use of an extended progressive diagonal roll bar which helps with pronation and gait cycle. I also liked the fact that the foam insole is removable allowing you to add or replace the inserts if necessary. The soft fabric lining inside the shoe also adds to its comfort. The Brooks Addition good arch support and accurate sizing. If you have wide feet like me, you may find the toe box to be too narrow for your feet. Also, the shoes were too heavy for my liking. When it comes to buying a running shoe that is specially designed for ankle support, the Brooks Beast ’16 is my recommendation. The shoe is designed to provide the high level of cushioning and motion control which is very important if you have weak ankles. Another feature of the shoe is the external heel counter which adds to the stability of the shoe. The midsole of the shoe uses Super DNA technology for maximum cushioning and improved energy support, return and flexibility. The mid-foot is designed to promote torsional rigidity which allows the heel and forefoot to act independently. The wet-dry traction and anti-skid outsole make it ideal for those who need ankle support. All these features combined can greatly reduce your chances of experiencing ankle pain after running. Although the shoe is ideal for running, it may not be a good choice if you plan to wear it all day. Also, if you are a fan of bright, attractive shoes, the bland design of the Brooks Beast ’16 may not be appealing to you. If you suffer from ankle problems, you have a special set of needs that may not be met by ordinary running shoes. As challenging as it already is to select the best shoes for running, choosing shoes for ankle support is even more challenging. I have put together a few tips on things to consider when choosing shoes for ankle support. Although you should always make it a goal to wear proper fitting shoes when you run, if you suffer from ankle pain, the importance of proper fitting shoes doubles. Wearing ill fitting shoes can cause short term problems including corns, athletes foot and nail problems but prolonged use has more serious consequences. For example, collapsed arches are a common result of wearing the wrong fitting shoes. Back pain and joint pain are other negative results from wearing shoes that don’t fit. You will need to get a shoe that is cushioned in the inside but firm on the outside. Such a fit helps to prevent your ankle from going over. You need to get a shoe that has balance and provides ample stability. Make sure the shoe you choose has adequate width. You will also need to make sure the shoe offers ample arch support inside the shoe. Choosing the right arch support starts with knowing what arch type you are. Once you determine this, you will be better equipped to find the right shoe. For those with normal/medium arches, stability shoes are a wise choice but generally speaking, you will be fine in any shoe that fits properly. For those who are flat footed (have low arches), look for shoes that include features like dual density midsoles and motion control. It is also recommended that you choose shoes that have a firm support. If you are among those with high arches, find shoes that are neutrally cushioned and have a soft midsole. Stay away from shoes without extra stability features which help reduce pronation. The style of your sock should depend on more than just your personal preference. For example, if you are running on trails with thick grass, it would be wise to select knee high socks to prevent scratches on your legs. If you are prone to developing blisters in between your toes, then a toe sock could be appropriate. Depending on your shoe, foot and running terrain, you will be able to select the most appropriate style. If you have a foot condition such as a lump on your ankle, then you would need to find something that does not cause any pain. In order to customize your shoe to fit your individual arch support, you can also consider getting insoles. There are specially designed insoles for those with ankle support problems or those who have experienced a popping sound in the ankle. To make sure that your insole fits properly, first stand on the insole outside the shoe. Check for the degree of stability by lifting your other foot so that you are only balancing on the foot with the insole. This will help you determine how supportive the insole is. Next, insert the insole and wear the shoe. Consider the amount of volume the insole takes up is just right for the kind of shoe you have and the activity you are engaging in. Even if your shoes may look fine, it may be time for them to say goodbye. Worn out running shoes can no longer provide the right arch support, cushioning and ankle support that you need to ensure all the right muscles are working when you run. Continuing to use worn-out running shoes is not just a bad idea but it is dangerous. Injuries such as plantar fasciitis, shin splints and runner’s knee can all be triggered by wearing shoes that provide no support. I have so pleased I was able to come up with five top choices for my friend. The New Balance Fresh Foam 1080v7 is on top of my list because of its thick and stable foam layer and good heel support. If you are looking for something that is softer and doesn't mind a bulky appearance, then the HOKA ONE ONE Bondi 5 shoes are a good idea. They have a thick sole which provides great support and compression. For those who are on a tight budget, the Reebok Ultra V DMX Max has a very reasonable price and still provide ample ankle support. The Brooks Addiction 13 is a good pick if you are willing to spend a little bit more on your shoes. They offer pronation support and are even environmental-friendly. Lastly, the best shoes for ankle support, in my opinion, are the Brooks Beast '16. The shoe is designed to provide the high level of cushioning and motion control which is very important if you have weak ankles. What Are The Best Plantar Fasciitis Socks In 2018? Find Out! Best Compression Tights In 2018 – Can They Make You Run Better?